Frozen Strawberry Chocolate Yogurt Bark is a delicious, wholesome treat perfect for the whole family to enjoy! Whole milk Greek yogurt is lightly sweetened then topped with fresh Florida strawberries and dark chocolate. This recipe makes a great dessert or snack! Are you looking to eat better in the new year? If so, this recipe is for you. 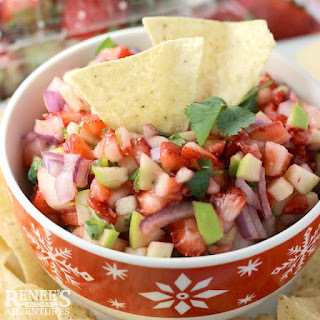 Fresh red, ripe, sweet, Florida strawberries are in season NOW (December through April) and perfect in this good-for-you recipe. Did you know that just 8 Florida strawberries provide more vitamin C than one orange? Yup, it's true! 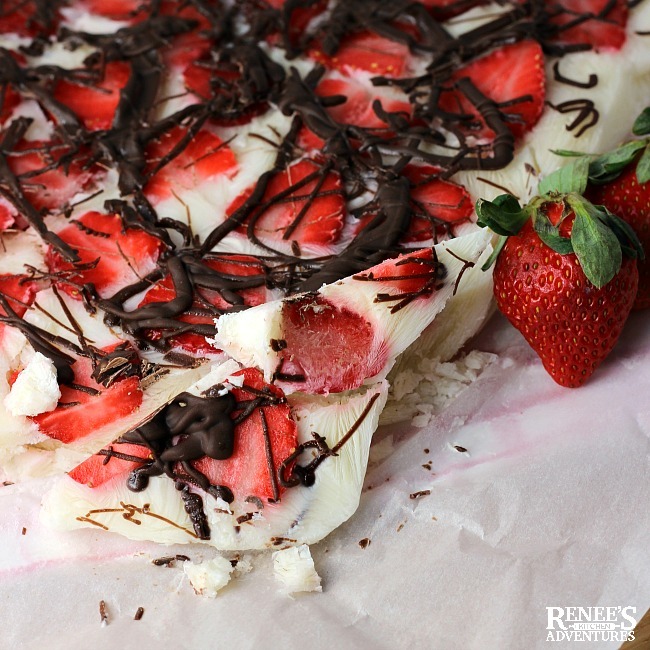 So why not take all the goodness Florida strawberries have to offer and transform them into this easy-to-make wholesome and delicious Frozen Strawberry Chocolate Yogurt Bark? It's perfect for dessert or a healthy snack anytime! Make sure you use whole milk Greek yogurt to get the creamiest bark. You still may get ice crystals, but not as many as you would get with lower fat content yogurt. Freeze only until it is firm. This will allow you to be able to cut the bark more easily. If too hard, let the bark sit out and defrost a bit before attempting to cut it. Too cold for a frozen dessert? Make this bark into a delicious parfait by spooning the sweetened yogurt into a dessert glass and topping with strawberries and chocolate! 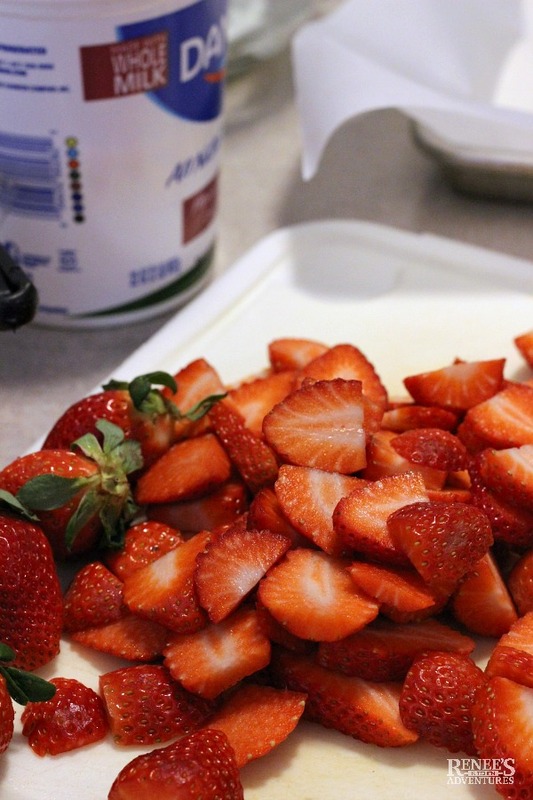 Pump up the strawberry flavor by adding half the strawberries to the lightly sweetened yogurt and blending them for a few minutes, then spread out on prepared baking sheet and top with the rest of the strawberries and chocolate! 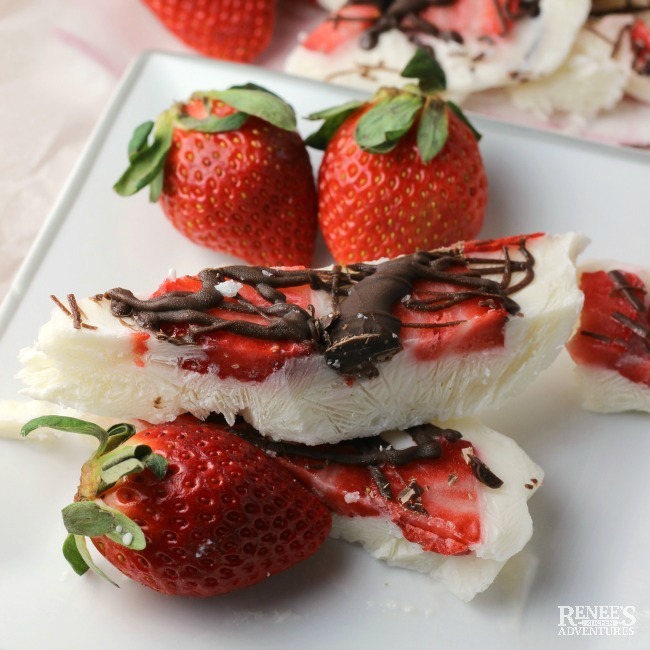 Fresh Florida strawberries top lightly sweetened Greek yogurt topped with dark chocolate for a wholesome sweet treat! In a bowl, combine the honey and the whole milk Greek yogurt. Line a rimmed baking sheet (I used a quarter sheet pan) with parchment, allowing it to hang over the edges. Spread the yogurt mixture onto the parchment paper, pushing it to the edges to create a "bark"
Top bark with sliced strawberries, pushing them down into the yogurt slightly. Drizzle with melted chocolate. Freeze for several hours or until firm. Cut into pieces. Serve immediately. 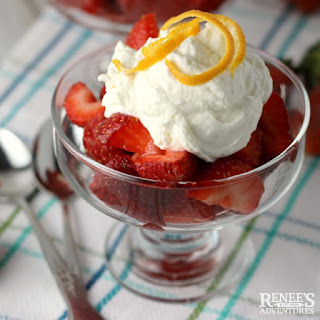 Don't miss these other healthy and delicious treats I've made with fresh Florida strawberries! 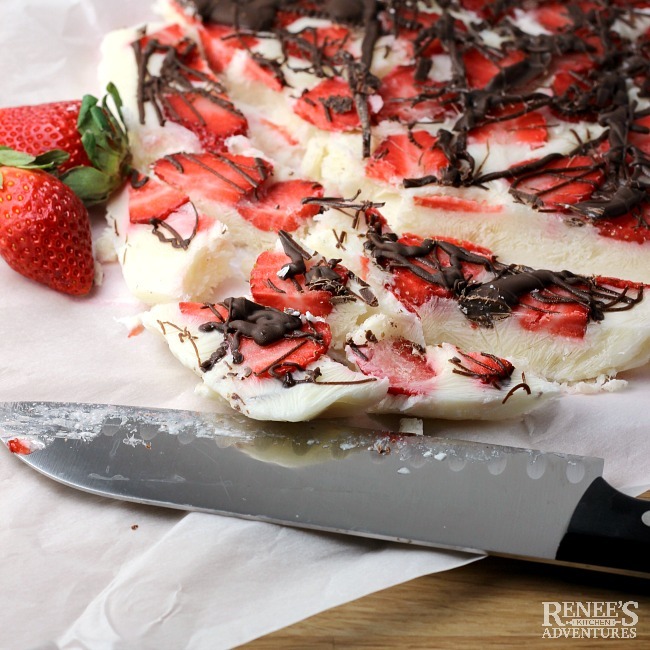 Pin Frozen Strawberry Chocolate Yogurt Bark to your boards! This looks awesome! I want to make this this weekend! I need to try making this with the fresh yogurt. awesome idea, Renee! What a wonderful treat! I'll have to try this one day soon. This is such a great easy treat. I never thought to make bark with Greek yogurt - that's pretty amazing!!! YUM!